I don't have a before picture to show, but this next one was a nice upgrade. The Law Office of Richard Flexner's new site has gone live, and it's lookin' good. 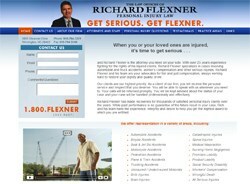 Richard Flexner offers representation in a very large variety of personal injury practice areas. With over 25 years of experience Richard Flexner has was it takes to win your case. So if you've been injured and looking for compensation, as the slogan goes, Get Serious, Get Flexner!